William Smith tombstone from the Cookshire Cemetery, Quebec. was from Uncle Tommy’s files”. Okay, so here I was at the reunion, chatting it up with the cousins, telling them what I hadn’t found again this year and getting frustrated. When I opened up the file folder, there were the original marriage licenses for my great grandparents, great great grandparents and SURPRISE, the names were the same, the dates were the same that I had searched for but I was looking at a totally new surname! Wow, for over 10 years I had spent money and time searching for my grandfather’s birth certificate, and his parents marriage back in England, I was in the right city but had the wrong name. What doors opened then! Here is what I have been able to find thus far. It’s so much easier to research when you actually have a name that is correct. William Newman, eldest son of James Williams Newman and Emma Ashby was born on the 23rd of December 1865 at back of 75 Charles Henry Street in Birmingham, England. 1881 Census for Birmingham, England James Williams Newman family, note son William. father or someone else, it is not known either way. At this time the family has moved 5 times since James Williams Newman and Emma Ashby were married in 1860, all in Birmingham . Hopefully, this means that James’s Confectioner shop was gaining status and he was moving up in the world from when he first started out on his own after his apprenticeship with John Clay. around Birmingham. They were both living in Birmingham by this time as per the marriage record just below shows. Amelia’s father had passed on by this time, so that data is missing from the marriage record, her mother, Eliza is still living though. They were married at the Parish church of Immanuel in Birmingham on the 28th day of November 1886. William and Amelia’s little family grew with the birth of Kate Reynolds Newman was born the 9th of October 1887 and William James Newman born the 20th of April 1889 with the family living at back 110 Morville Street in the Ladywood parish of Birmingham, England. Amelia’s mother had been living with them during this time, this address is what is given on Eliza Amos Reynold’s death registration, death occurred on 8 October 1889. 1891 England Census William , Amelia, Kate and William living at back 110 Morville St., Ladywood, Birmingham, England. 1901 England Census St Mark’s Cottages, William is a coal dealer living on own accord, Amelia, Kate 13, William James 11, Winifred D age 7 months. The house had 3 rooms occupied. at this time is Newman. So much easier to find in the census when you are looking for the “real”surname. Now that is what we know about William Newman’s life in England. He next shows up on the passenger list for the ship S.S. Parisian leaving Liverpool on 17th of April 1902 and landed in Quebec on the 26th of April 1902. William is now going by the surname of Smith. His land is bought in that name, census for 1911 and 1921 are under Smith. 1921 Census Smith family living in Sherbrooke with Marie Adele Bouchard staying there. 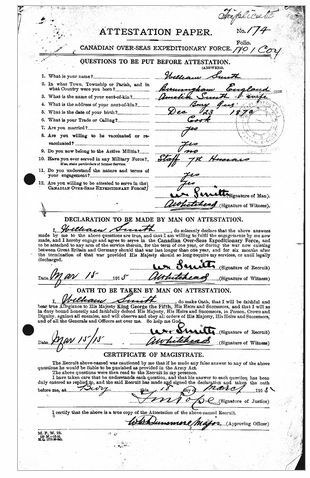 William Smith Attestation Papers for WW1 and the Canadian Expeditionary Forces, note his year of birth. He would have been too old to sign up and story tells us that he wanted to save his son William from having to go to war. that he had been in the Stafford 7th Hussars. I have not found that regiment anywhere, has anyone heard of it. My William has interesting stories that have no substance I have found. The reason I tell you this is that there is a period of time 1888-1900 where there aren’t any children born with Amelia. I believe he is somewhere just not sure where. I can’t locate him in the Army or in Canada or the States. 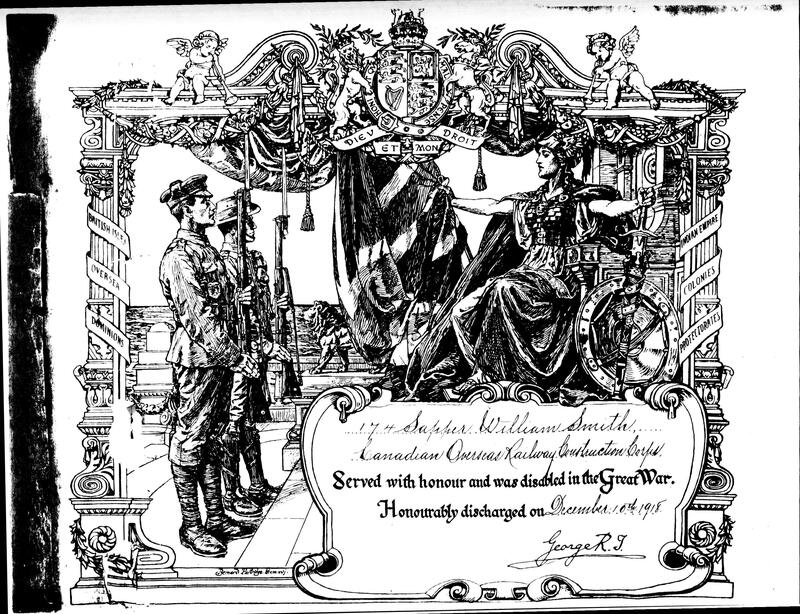 Served with honour and was disabled in the Great War. Honourably discharged on December 15th, 1918. 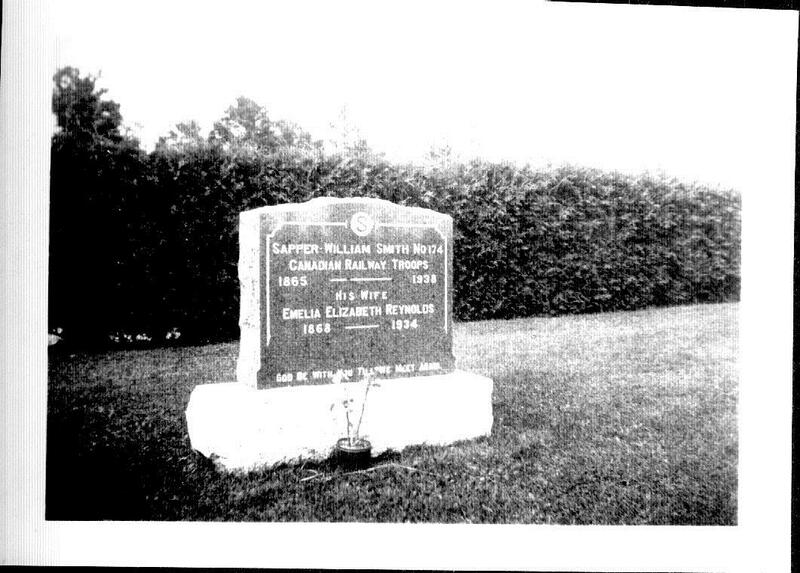 William worked for the Canadian Pacific Railroad for a number of years as a Cook. I have a letter detailing an assignment dated 20 September 1921 for some construction work North of Kipawa placing him as a cook on a residency; salary of $80.00 a month with expenses. When he travels back to England, which he does frequently, it is under the Smith name. He gives the address of his sister Jane Newman Smith, wife of Henry Smith as his destination. By the photos we have of that era, it appears that he was very close with Jane and her family. If you remember reading the blog “#2 James Williams Newman”, James was Williams father and he died in 1882 leaving behind a young family and no way for his wife Emma to care for them all. Life must have been quite hard, not having a profession, not having the resources to provide for the large family. When James dies there are 7 children ages 1 – 21 at home, Ellen having married in 1881 and Jane in 1882. Unfortunately, life must still have been hard as we know that the youngest three children were given into the Middlemore Association in 1886. They were part of the Home Children, being sent to Canada for a “better life”. Yes, it was green, and probably conditions were better but still to rip your family apart must have been the ultimate betrayal for young William. On taking in the whole process and outcome, I feel that being close to Jane and Henry Smith, he decided to change his name to Smith,honoring the family that might have given him help to start fresh in another country. According to the census in Canada, William, Amelia and Winifred came to Canada in 1902. I have located a passenger list for Amelia and Winifred and a separate one for William coming in earlier the same year. My grandfather William aged 15 years and his sister Kate aged 16 years left England to join their parents in 1903. I have a bible that a Mrs. Perkins of Stourbridge gave to my grandfather William on his departure for Canada, wishing him good luck in his new life and it was addressed to Wm J Smith dated right before his voyage to meet up with his parents. Stay tuned for the continuing saga of the Newman Smith family. 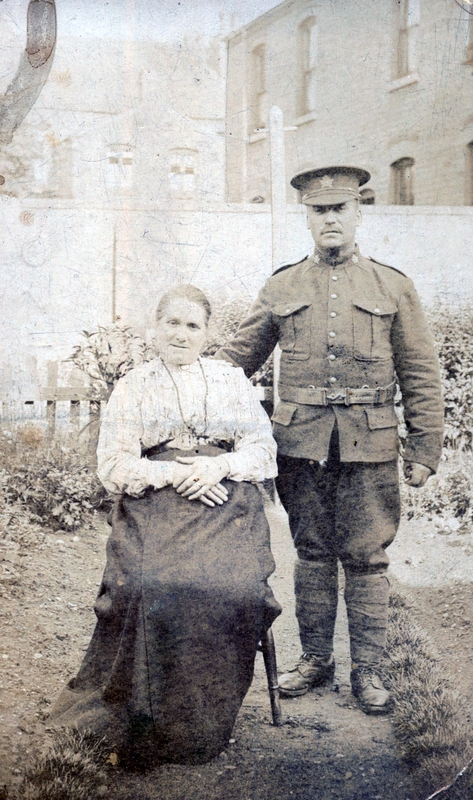 This entry was posted in Elusive Ancestor Hunter and tagged Amelia Reynolds, Birmingham, Bury, Canadian Expeditionary Forces, Canadian Pacific Railway, England, Quebec, Stafford 7th Hussars, William Newman. Bookmark the permalink. 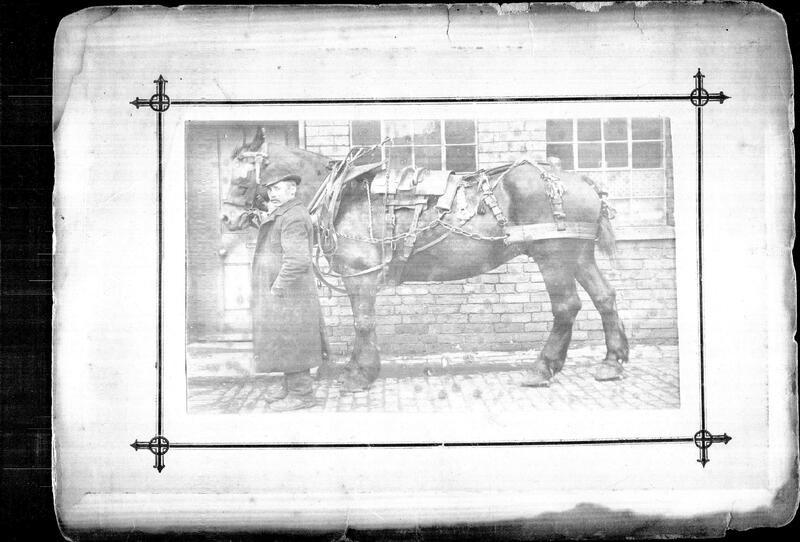 5 Responses to 52 Ancestors – #7 William Newman or William Smith, who are you really? Hi Have you got this picture of Uncle Bill? Kate is my grandmother and the boy is my dad. The girl is his sister Lily who was killed in the bombing WW2. It is clearly taken at the same time as the one you used. It’s quite an interesting idea that he changed his name to link with his big sister who may have been a sort of mother figure. But I suppose you will never know the truth. Carmen went down the route that he had committed a crime and was changing his name to avoid detection but there was no evidence of that. I lOVE the WW! certificate. We are celebrating the centenary of WW1 this year – the Back to Backs are putting on a special event – and it would be interesting to know how many Newman/Smiths served, were injured or killed. Quite amazing how WW1 involved so many countries. How do you get the time to work and pursue so many hobbies???? Your blog was impressive as ever. Keep up the good work. PS What is the best way of communicating with you? My computer Is always losing your address. I think I have that photo, it’s not coming up on my ipad. I’ll check it when I get home tonight. The more I thought on why he would change his name the more I liked my version. Not sure if it’s right or not, but time might tell. I tried to give you all the information that I have uncovered up to now. There is a lot of it from over 35 years searching. I spread myself a bit thin at times, and don’t get a lot of sleep most days. My email is prob the best way. geneacathy@gmail.com or just drop a line on facebook I can catch you there. I live in bury. I may very well be able to help you. Thanks for checking in. Could you please email me at elusiveancestor@gmail.com. I do have a few questions about Bury that you might be able to answer. Thanks again for the offer. Love technology and the really small world we live in.